I have this wonderfull pasta book and all the dishes are written in Italian name ( i think atleast) and it is so funny to read the names if one don't know the language itself like me. Translated this dish is called Pasta withy peas and ham. My daughter loves this dish, everytime I make this her plate is fully empty. Only thing she picks out is the tiny pieces of onions in it. Melt the butter in a pan together with the oilive oil. Add the onions and garlic and fry for few minutes. Add then the ham , fry for few more minutes and now add the peas and the chicken broth. Cook for some five minutes till the peas are cooked. Add the cream and cook boil for 2 minutes. Add salt and peper to your taste. In the mean time cook the pasta and drain.Add the drain pasta to the sauce, mix well and serve with grated cheese and parsley. It looks delicious, no wonder your daughter eats it all up! 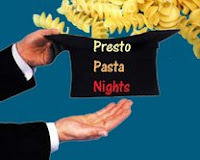 Thanks for sharing with Presto Pasta Nights. Ham. cream and peas? How wonderful! I can understand your daughter cleaning her plate - so would I!! This looks delicious Happy Cook - can't go wrong with this combination. I love the fact that it uses shell pasta - the shape appeals to me. Oh you sure know how to make me happy my 'dear Happy'!! I adore pasta and this combination of ham, cream, peas & cheese is just gorgeous!!!! I love Prosciutto! I will eat anything with Prosciutto in it. DROOOOOOOOL. Great recipe yaar. This sounds like perfect pasta! Great entry to presto pasta! Happy, that pasta looks so comforting. It's cold & rainy here and this would set me straight. I just made a risotto dish with peas and prosciutto that I'll be posting on. So I know I'd love your pasta dish. the pasta looks fantastic, HC! still trying to pronounce the name, he he! nice pic. Lovely entry...The ham in it makes it all the more tempting! This looks creamy, dreamy, and absolutely DELICIOUS! Happy this is absolutely delish and I will be trying this recipe out soon, thanks for sharing! Your daughter can really pick out the small onion pieces?! Wow, she's good. Well lucky she has a mom like you to make some great food for her! Hi everybody thankyou all for you lovely comments. Was busy this weekend, sodidn't reply individualy. Lovely, rich pasta. Wonderful entry.